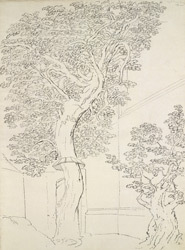 An outline view in ink of a Mulberry Tree (probably in Magdalen College Garden) at Oxford, drawn by S.H. Grimm. Grimm drew a number of views of Magdalen College Gardens of whatever caught his eye. The college had a number of walks in the gardens visitors could take.